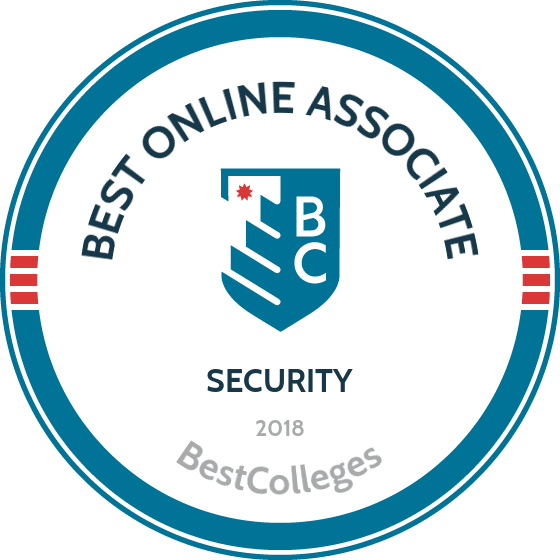 What Are The Best Online Associate in Security Programs? What Else Can I Expect from an Online Associate in Security Program? What Can I Do With an Associate in Security Degree? With rising threats against information security and privacy, now is an ideal time to enter the field of security management. Computer hackers are becoming more sophisticated, and companies and agencies are hiring specialists to secure their data. Because of these threats, jobs in the security field are growing at a rate that far outpaces the national average. The Bureau of Labor Statistics projects the employment of information security specialists to grow by 28% between 2016 and 2026. The BLS projects employment for emergency management directors, security guards, gaming security officers, and security managers to increase, as well. An online security management associate degree qualifies candidates for entry-level positions in the field and prepares graduates for advanced studies. Located in San Antonio, Texas, Palo Alto College enrolls over 9,000 students annually (many of whom come from underserved communities) in career-training and academic programs. This includes distance education options like the online associate of applied science in information security and assurance, which trains students to develop, analyze, and secure computer networks. The 60-credit degree includes courses like digital forensics, incident response, and Cisco routing protocols and concepts. The program culminates with an internship, facilitated by the college and an employer. The internship experience enables students to build professional relationships and apply specialized concepts and skills while gaining work experience. All courses for this online security management associate degree can be completed asynchronously. PAC welcomes all students through an open admission process that contains no minimum requirements. Tuition is affordable and distance learners have access to a number of scholarship opportunities, including awards for hispanic and transfer students. Schoolcraft College serves more than 36,000 students every year through career training and professional development courses and programs, many of which are offered online. This includes an online associate of applied science in homeland security that helps students develop the skills necessary to protect their communities from natural and human-made disasters. Students take 60-64 credits in courses like criminal investigation, understanding terrorism, and intelligence analysis and security management. Homeland security is a rapidly growing field and the Schoolcraft program prepares graduates for earning advanced degrees or careers as first responders, aviation security officers, and cybersecurity specialists. Schoolcraft's offers its online associate degree in security management as a hybrid program. Students are required to attend certain classes at the Livonia, Missouri campus. All distance learners enjoy affordable tuition prices based on residency status and scholarships are available, including awards for adult learners. Online students can also access tutoring services and career development resources. Saint Leo University enrolls over 16,000 distance learners every year in a variety of flexible online programs, including the online associate of arts in cybersecurity. Through a comprehensive curriculum, students learn to assess risk, troubleshoot problems, and develop methods to protect information systems and networks against attacks. The U.S. Bureau of Labor Statistics projects that the cybersecurity field will grow by 28% between 2016 and 2026 as our world becomes even more connected through technology. Saint Leo graduates stand ready to gain additional academic credentials or occupy leadership positions as network administrators, information security engineers, and program managers. Saint Leo students can begin earning the online security management associate degree at six points during the year. The school delivers online classes asynchronously in eight-week terms (although a few courses last 16 weeks). All distance learners enjoy the same affordable tuition rate and may apply for funding, which includes generous merit scholarships. Located in Toms River, New Jersey, Ocean County College has been providing affordable, career-building academic programs for more than 40 years. This includes distance education programs like the online associate of science in homeland security, which teaches students core skills in emergency preparedness, response, and prevention through asynchronous coursework based on case studies and practical scenarios. The 64-credit degree plan consists of classes in risk management and analysis, intelligence function, and domestic and international terrorism. Students can personalize the online associate degree security management curriculum to their specific professional interests with electives. Distance learners can access a variety of academic resources, including one-on-one advising, library services, and around-the-clock online tutoring through the Smarthinking platform. The school also provides support for students searching for career opportunities or applying as transfer candidates to four-year colleges and universities. Ocean bases its affordable tuition rates on residency status, and financial aid is available. Founded in 1927 as Florida's first two-year higher education institution, St. Petersburg College continues to be a leader in accessible learning, providing over 100 remote classes and several online degrees. The school offers an online associate of science in cybersecurity, a well-rounded program that helps students develop the fundamental knowledge and technological prowess to tackle complex information security issues. Students take 60 credits in courses such as operating system security, ethical hacking, and incident response and disaster security. They must also complete an internship, gaining valuable hands-on experience and networking opportunities. The program equips graduates with the skills necessary to work in the expanding cybersecurity field in a variety of contexts, such as private healthcare organizations and federal government agencies. To apply to this online security management associate degree, applicants need only submit the application form and pay a small fee. The school does not require students to submit standardized test scores or meet a minimum GPA. All distance learners can access financial support, including awards for eligible high school students and even funding for study abroad trips. Delta College routinely garners praise for the quality and affordability of its more than 100 programs, which include many online options such as the online associate of applied science in cyber security. Through asynchronous study and hands-on skill development, students gain the skills needed to protect the electronic privacy of companies and individual clients. Totalling 68 credits, the degree plan consists of courses like implementing firewalls, network intrusion security testing, and advanced wireless security. Continued job growth in the field means graduates have ample opportunities to find work in positions as security management specialists, information technology managers, and ethical hackers. While students can complete most of their online associate degree security management remotely through the Desire2Learn platform, some classes may require on-campus attendance. Delta's tuition is based on residency status and financial assistance is available, including the Nickless Transfer Scholarship for students who want to continue their degree at a four-year institution. Additionally, 150 dedicated transfer pathways make this process even easier. Located in Ft. Lauderdale, Florida, Broward College enrolls over 63,000 students in career-training, technical, and academic programs, including many accessible online degrees. The school's online associate of science in computer and network security trains students in fundamental system and database management skills that prepare them for advanced degree work or entry-level positions in security-based sectors. The 63-credit degree plan contains courses like advanced router technology, internet site design, and network defense and countermeasures. Degree candidates must also complete a ethical hacking capstone experience. Broward's online security management associate degree welcomes all students, especially working professionals. In addition to applying prior college experience, students can earn credits towards degree completion from career training and certification, such as the Cisco Certified Network Associate credential. Distance learners enjoy some of the lowest tuition rates around, regardless of where they live. Additional support includes online tutoring and career development assistance. With roots dating back to 1887 when the first class of 16 students convened in a small church, Campbell University is now a comprehensive degree-granting institution. Among the distance education options the school offers is an online associate of science in homeland security, a 64-credit program that covers fundamental topics in risk management, infrastructure defense, and disaster response, including acts of terrorism. Students develop skills through project-based, collaborative study and in-depth analysis of case studies and federal best practices. The entire degree can be completed remotely through asynchronous and accelerated eight-week classes, or degree candidates can opt for a hybrid learning experience by mixing online courses with classes on the Camp Lejeune extended campus. Campbell admits students on a rolling deadline, so distance learners can begin the online associate degree in security management at their convenience. Tuition is affordable and nearly 90% of Campbell students receive scholarships or other financial aid. Located in Richmond, Eastern Kentucky University is dedicated to providing accessible academic opportunities for distance learners. The school offers over 40 remote undergraduate and graduate degrees, including two options for students interested in the security field: an associate in general studies with a concentration in either security management or homeland security. Both degree plans total 64 credits and cover fundamental topics like cybersecurity, disaster relief, and team leadership, preparing students for gainful careers or bachelor's programs and beyond. The security management concentration provides a generalist path, while homeland security deals more specifically with contemporary issues of terrorism. Both degrees are entirely online with asynchronous, eight-week classes, enabling students to work while earning their degree full-time. Over 80% of online security management associate degree students receive financial aid, on top of EKU's affordable tuition rate. EKU also has a generous transfer policy, accepting up to 49 credits, to further reduce costs. Founded in 1960, Miami Dade College focuses on academically supporting underserved and nontraditional students and its undergraduate population is one of the largest in the nation. Distance learners, too, can find affordable courses and programs, such as the associate in science in security management and administration. The curriculum totals 60 credits and helps students develop the leadership and problem-solving skills to work in both the federal homeland defense and private security sectors. Course topics include crime scene technology, human behavior in criminal justice, and transportation and border security. Students also have 12 elective hours with which to personalize their degree plan. Most students complete MDC's online associate degree in security management in two years. Tuition rates are among some of the lowest in the nation, especially for Florida residents. MDC also offers generous financial aid packages and 90% of students graduate without incurring any debt. The college also sets up its students for success by providing online tutoring and personalized career services. Sinclair Community College is located in Dayton, Ohio and offers over 220 academic programs to 32,000 students annually. The school also provides distance education options, including degree programs like the online associate of applied science in computer information systems/secure system administration. With a 61-credit curriculum, the SCC program provides a comprehensive overview of core computer programming and systems analysis as well as effective communication and team management skills, enabling students to pursue additional schooling or careers in many fields, from cybersecurity to criminal justice. Additionally, several of the courses prepare students for professional certification from CompTIA and Microsoft. Distance learners receive competitive tuition prices, with out-of-state residents paying a little more due to surcharges. Students earning their online associate degree in security management enjoy a variety of professional development resources, such as internship support and career services. SCC maintains articulation agreements with many schools in the region, making the transition to pursuing a bachelor's degree simple and affordable. Peninsula College is a leader in equitable education, providing classes and degrees for students of all backgrounds at its three campuses on Washington's scenic Olympic Peninsula and online. The school's online offerings include 23 options for distance learners, including two online security management associate degrees: an associate of applied science in cybersecurity and computer forensics and one in homeland security and emergency management (HSEM). The first program totals 90 quarter credits, while the the HSEM degree consists of 98. Both prepare students for advanced degrees or entry-level positions through a combination of theoretical study of selected topics and practical skill development in effective communication, problem solving, and team leadership. The HSEM program is more comprehensive and is generally more suited to students who plan to enter the workforce immediately upon graduation. PC offers four entry dates per year and delivers its coursework entirely online using the Canvas platform. Distance learners can access many resources, such as e-tutoring and additional academic support through the Maier Hall Learning Center. Founded in 1963 as an extension program for another institution, Mesa Community College now stands as an independent school that enrolls more than 40,000 students each year in its over 195 programs, degrees, and certificates. Academic programs include distance education programs like the online associate of business with general requirements in networking and security. Facilitated through the Canvas platform, the program helps students develop the skills necessary to create, analyze, and manage information systems and networks to prevent malfunction and cybersecurity threats. Additionally, the program prepares students for professional certification in Linux, Microsoft, and Cisco proficiency, many of which can be earned through MCC. While all online students pay a low tuition rate, MCC's online associate degree in security management program is even more affordable for Arizona residents. MCC also assists its students through academic services like individualized advising and online tutoring. Additionally, the school offers comprehensive career services, from resume-building workshops to internship placement. Sheridan College is one of Wyoming's outstanding two-year degree and certificate granting institutions. Distance learners have numerous academic options, such as the online associate of applied science in cybersecurity. The Sheridan program prepares students for jobs in information security with a 60-credit degree plan of courses like hardening network infrastructure, computer forensics, secure user endpoints and server systems. The curriculum also includes an internship requirement and self-directed electives. Sheridan bases tuition on residency status, with in-state students paying the lowest rate and those in participating Western Undergraduate Exchange states receiving a discounted rate. Students earning their online security management associate degree can access the school's generous financial aid resources as well as student services like subject tutoring and technical support. Located in Great Bend, Kansas, Barton County Community College serves students of all backgrounds through academic programs on its main and extended campuses as well as through its distance education platform. The schools online offerings include the online associate of applied science in emergency management and homeland security, a 64-credit program that contains courses like emergency planning, developing and managing volunteer resources, and characteristics of hazardous materials. The BCCC degree stands out among other online associate degree in security management programs for its focus on environmental disasters and conservation, which students can choose to pursue in-depth through guided electives. All distance learners pay the same tuition rate regardless of where they live. Online students also receive academic and professional support from BCCC in the form of advising, professional development and career training opportunities, and even personal counseling. Many of these efforts are supported by TRIO, a nationally funded program designed to foster student retention and overall success. Located in Binghamton, SUNY Broome Community College enrolls students in a variety of programs, more than a dozen of which an be accessed entirely remotely. These online offerings include an online associate of applied science in computer security and forensics, which trains students to prevent identity theft and loss of financial resources due to the mishandling of electronic information. The degree plan totals 64 credits and includes courses in cryptographic systems, structured programming, and security hardware and software. Students graduate from the program with the cybersecurity tools that lead to success in advanced degree programs or careers in fields like information technology and criminal investigation. The school delivers its online security management associate degree courses asynchronously through the Blackboard platform. Distance learners pay tuition based on residency status. SUNY Broome offers a variety of financial aid awards, including the full-ride Presidential Honors Scholarship for high-achieving local students. Located in Duluth, Minnesota, Lake Superior College boasts a integrated distance education platform, offering over 200 remote courses and 90 certificate and degree programs. The school offers an online associate of applied science in network administration and cybersecurity that teaches students the technical knowledge and programming skills to manage computer networks in all sorts of business environments. Totalling 72 credits, the LSC program is one of the most comprehensive online associate degree in security management programs available. In addition to core topics like computer user support, ethical hacking, and emerging technologies, students have 15 elective hours with which to pursue their professional interests. The curriculum also includes internship and capstone requirements. LSC charges a flat tuition rate to all online learners regardless of residency status. The school offers three start dates each year. Students can earn their AAS in two years if they have fulfilled English and math prerequisites. This cybersecurity degree online meets the academic requirements for cybersecurity set by the National Security Agency. North Central Texas College was established in 1924 under the guidance of Randolph Lee Clark, a pioneer in American public education. Today NCTC offers six undergraduate degree types, including distance education programs like the online associate of applied science in cyber security. Totalling 60 credits, this NCTC program provides students with an understanding of the cyber threat landscape and the tools needed to protect computer systems and networks against attacks. Students take courses in areas like intrusion detection, security assessment and auditing, and computer virtualization. The curriculum also includes a cooperative education practicum, in which students hone learned skills in an actual work environment under supervision of an employer and the college. NCTC's online security management associate degree curriculum combines fully remote coursework with hybrid and traditional classes to create a learning experience that is both flexible and hands-on. Many degree courses are structured in accelerated eight-week sessions, and most students earn their degrees in two years while maintaining jobs. Founded in 1969, Maysville Community and Technical College offers flexible and career-building academic opportunities for adult learners. This includes remote degree programs like the online associate of applied science in criminal justice with a specialization in security loss and prevention. This unique program provides students with an overview of the U.S. justice system and the processes within it, with additional emphasis on the protection of tangible and electronic assets. Course topics include criminal procedures, business and financial fraud, and physical security technologies and systems. Degree candidates must also fulfill capstone and internship requirements. The MCTC online associate degree in security management totals 60 credits, which can be completed in two years of full-time, 15-credit semesters. The college welcomes all students through an accessible enrollment process. To apply, interested students need only fill out the online application. Online learners pay the same low tuition rate as traditional in-state students and can apply for several institutional scholarships. Located in Waco, Texas State Technical College has been helping students achieve professionals goals for over 50 years through affordable technical and academic degree offerings, which include remote programs like the online associate of applied science in cyber security. Through a 60-credit degree plan, students learn to protect private data, retrieve stolen information, and identify intruders. The curriculum covers fundamental topics and includes a security assessment and auditing capstone seminar. TSTC graduates are well-equipped to enter four-year schools or obtain gainful positions as information security analysts and forensic science technician. The TSTC online security management associate degree program takes approximately 20 months to complete. With flexible, asynchronous classes, students can earn their degree while working and attending to other personal responsibilities. To apply, candidates only need to submit a high school diploma or equivalent. Those who do not have the aforementioned credential can still enroll by going through an approval process and passing an assessment exam. Security professionals may work with computers, create emergency plans, or conduct field investigations. Because of the variety of positions in the field, program curricula vary widely. Some security management programs highlight technology. Others focus on incident command, and others emphasize administration and leadership. All security programs provide foundational knowledge of security principles and prepare students to protect personnel and property against imminent threats. Curricula vary drastically among online associate in security programs. However, some requirements are common to most programs. While earning an online associate degree, security management students typically complete general education courses in English, math, and the humanities, and many programs begin with an introduction to the field. Composition: Students in most associate programs must pass a college-level writing class. Effective written communication is vital to every academic and professional endeavor, and this class covers the basics of writing, grammar, clear and logical reasoning, argument defense, and essay construction. Introduction to security management: This course provides an overview of the security field and covers topics including homeland security, risks and threats, fire prevention, asset protection, insurance coverage, terrorism, and cybersecurity. Learners may also study theft, drug culture, violence, and the impact of vice on security issues. Criminal procedure: This course explores the United States criminal justice system and covers tools used by law enforcement professionals. Topics include arrest, investigation, evidence collection, and the legal system. Students gain an understanding of the Constitution and the protections it affords citizens. Emergency management: This class covers incident command, emergency response, and disaster mitigation. Learners explore public safety, including man-made and natural disasters and acts of terror. Topics include public relations, warning systems, asset administration, communications, and disaster recovery. Homeland security and terrorism: This course explores threats to national security in the post-9/11 world. Coursework covers modern terror networks, terrorist goals and methods, and tools used by intelligence networks. Students examine economic and political decisions, defense planning, and national strategy. How Long Does it Take to get an Online Associate in Security? Full-time students generally complete an online security management degree in two years. Most programs require 60 credits. However, several factors affect individual completion time, including previous credits and enrollment status. Online learning is ideal for working professionals and easily accommodates part-time studies, which may increase the time required to graduate. Some security management programs offer prior learning credits to students with military or law enforcement experience, which can reduce degree completion time. Program structure also impacts the time required to graduate. While earning an online associate degree asynchronously, security management students complete program requirements at their own pace. This allows students to control their degree completion time; students can take more classes simultaneously to graduate more quickly. Other online programs are cohort-based and require students to take courses one at a time, with a small group of peers. While this structure builds community, learners must progress through courses at the same pace as their classmates. Students pursuing an online security management associate degree should choose an accredited program. Attending an accredited institution ensures that future employers will recognize your degree and that earned credits will transfer to a four-year institution. The most common types of accreditation are regional and national. Regional accreditation, awarded by six agencies, is the most common and the most highly regarded. Nationally accredited schools generally focus on vocational programs. Accredited schools submit to regular audits to ensure they maintain acceptable standards of quality. The U.S. Department of Education (ED) and the Council for Higher Education Accreditation (CHEA) oversee accrediting agencies. The ED is a federal agency that ensures the quality of the nation's schools and universities. The ED sets policy, administers assistance, and maintains a database of accredited schools. CHEA is a private agency that monitors accreditation issues and maintains a database of accredited schools and programs. After earning an online associate degree, security management professionals work in a variety of roles. Many graduates pursue positions in emergency management, homeland security, law enforcement, cybersecurity, transportation security, counterterrorism, and corporate security. Professionals may work in offices, conduct field investigations, or work in computer labs. An associate degree also provides a foundation for future studies in the field. Emergency management directors work in the public and private sectors, preparing communities and companies to respond to natural and man-made disasters. They work with public officials, nonprofit organizations, and corporations to plan and strategize, evaluate threats, assess risks, respond to emergencies, and coordinate recovery efforts. These positions require further education, but an associate degree prepares students for advanced studies. Businesses, government agencies, tech companies, and nonprofits hire information security analysts to protect their computer systems from viruses, malware, and other threats. These positions require both IT and security administration knowledge. Analysts design secure networks, search for breaches, conduct risk assessments, and investigate hacks. Today's security guards are highly trained and often hold degrees in security. These professionals guard property against theft and vandalism, monitor security cameras, check ID badges, and surveil corporate facilities. Gaming surveillance officers perform similar tasks at casinos and racetracks. Transportation security screeners ensure the safety of passengers on planes and trains. They check suspicious bags, scan travelers, search cargo holds, monitor computers and X-ray machines, and investigate threats. Most of these professionals work for the federal government. Security managers are responsible for the safety of employees at corporations and government agencies. They establish security procedures, monitor facilities, investigate security breaches, and assess risks and threats to personnel, products, and physical locations. Earning an online security management associate degree is the first step toward a career in the field. Associate programs provide foundational knowledge and skills that prepare students for bachelor's or master's programs in emergency management, homeland security, criminal justice, and computer security. Professionals with advanced degrees generally earn higher salaries. According to the Bureau of Labor Statistics, bachelor's degree holders earn about $340 more per week than associate degree holders. Homeland security: Associate degree holders must complete about 60 additional credits to earn a bachelor's in homeland security. The degree builds on topics covered during security management associate degree programs and generally requires two additional years of study. Emergency and disaster management: Emergency and disaster management programs require coursework in topics such as the politics and policy of emergency management, disaster research, and social impacts of disasters. Computer security: Course requirements for most online security management associate degree programs satisfy many requirements for a computer security degree. However, computer security programs include further studies in information technology and network security. After earning an online associate degree, security management professionals earn varied salaries. Individual salaries depend on factors including experience, position, and education level. For example, security guards earn less than computer security professionals at large firms. Government positions as screeners for the TSA offer job security, but little opportunity for advancement or increased earning potential. Even within a single profession, salaries vary widely by field of employment. Professional organizations offer resources to students and graduates of online security management associate degree programs. These organizations provide opportunities to network with industry professionals; many host annual conferences and local chapter meetings. They also offer professional development and continuing education opportunities, publish the latest information in the field, sponsor mentorship relationships, maintain job boards, and advocate for the profession. An international nonprofit organization based in Virginia, ISSA is a global leader in cybersecurity. The association hosts forums and events, conducts research, offers networking opportunities, and provides reports and publications. A nonpartisan nonprofit, NEMA promotes public safety and national security. Based in Lexington, Kentucky, the association organizes committees devoted to homeland security and preparedness, hosts annual and semiannual conferences and forums, offers professional development opportunities, issues reports and documents, and provides online resources. This Virginia-based organization is an international community of security practitioners, including entry-level assistants, CEOs, and executives. The world's largest membership organization for security professionals, ASIS offers professional development, networking, and career advancement resources. Members have access to certifications, webinars, classroom programs, and publications. Best known for its professional certifications, the International Information System Security Certification Consortium is a professional association comprising IT security leaders from around the world. The nonprofit organization offers networking and collaboration opportunities, sponsors education, and advocates for the security profession. OSPA is a nonprofit organization that promotes awareness and education within the operations security profession. The association offers professional advancement opportunities, hosts an online learning portal, sponsors mentorship programs, and provides a reading room filled with relevant publications. Most students earn associate degrees through community colleges, which are more affordable than four-year universities. Still, many students still need help financing their associate degree in security. Students should begin by completing the Free Application for Federal Student Aid to determine their eligibility for federal aid, including scholarships, grants, and work-study programs. The American Society for Industrial Security provides scholarships for students in the field, and organizations such as the U.S. Navy and the CIA sponsor grants and scholarships, some of which require a period of service after graduation.